Final round, board 1, Todd Durham (1813) (L) vs Anthony Coleman (1885) (R), CFCC May Tornado held at the UCF Teaching Academy. 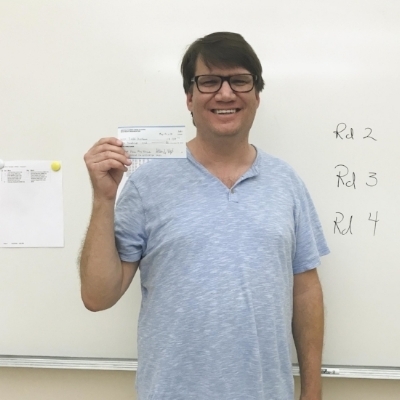 Congratulations goes to Clermont Chess Club's Todd Durham who won clear first place in CFCC's first summer tornado with an upset win and a final score of 3.5/4 in the 4SSG/75;d5 tournament event. The May CFCC Tornado was held at the UCF Teaching Academy, which I think is a great venue because the playing room is spacious and quiet. Heading into the tournament, I (2192) was the top seed by 246 rating points, followed by Andy Yang. The Tornado’s time control is G/75; d5, meaning that one game could last as long as two hours and forty minutes if both players used all of their time and the game lasted sixty moves. Given that Tornadoes feature four rounds in one day, one player could play up to ten hours and forty minutes of chess in the same day! Therefore, I would say this event is the ultimate endurance test! On board one, to kick off the tournament I checkmated Andrew Xing (1521) as White in thirty-two moves. Meanwhile, Evan Waters (1586) upset Andy as White! Anthony Coleman (1880) took a half-point bye in the first round, whilst Todd Durham (1813) defeated Scott Cox as Black. In the meantime, Leon Cheng (1730) beat Javier Rojas (1282) as Black and Arnold Banner (1855) overcame Charles Hatherill (1458) as White. In the antepenultimate round on board one, Todd played really well as White to mate me in the Queen’s pawn opening. It was the longest game of the round, with many people watching. Elsewhere, Andy bounced back with a win over Javier as White, Anthony triumphed in his first game against Tim Bowler (1436) with the Black pieces. Arnold beat Leon as Black, Evan defeated Darien Brown (1491) as Black, and Andrew rebounded to outdo Scott with the White pieces. On the top board in the penultimate round, Arnold quickly split the point with his co-leader, Todd, as White. Arnold admitted after the event that he was extremely tired and, “Playing like a zombie!” Todd, on the other hand, had just played a very long game against me, so was probably also happy to rest for the last round. Needless to say, Arnold used his break to have a nap! Concurrently, I got back on my feet with a victory over Leon as White in forty-seven moves, Andy topped Andrew as Black, and Anthony beat Evan as White. Going into the final round, Todd, Anthony, and Arnold were the joint leaders on 2.5/3. Todd was White against Anthony whilst Arnold was Black versus Andy. Todd emerged victorious in his game, whilst Andy overtook Arnold. On the other boards, I won against Evan as Black in the Queen’s pawn opening in twenty-nine moves, Leon shot ahead of Darien with White, and Andrew defeated Tim as Black to get back to fifty percent. All of this meant that Todd won the tournament outright on 3.5/4, winning $100 and gaining sixty-five rating points. Todd played extremely well throughout the tournament and thoroughly deserved his victory. Andy and I shared second and third place on 3/4, which meant we both won $45. Arnold and Anthony shared the U2000 prize on 2.5/4, each earning $15, Leon and Evan shared the U1800 prize on half marks, each winning $15. Finally, Andrew won the U1600 prize outright, winning $30 and gaining ten rating points. Congratulations!